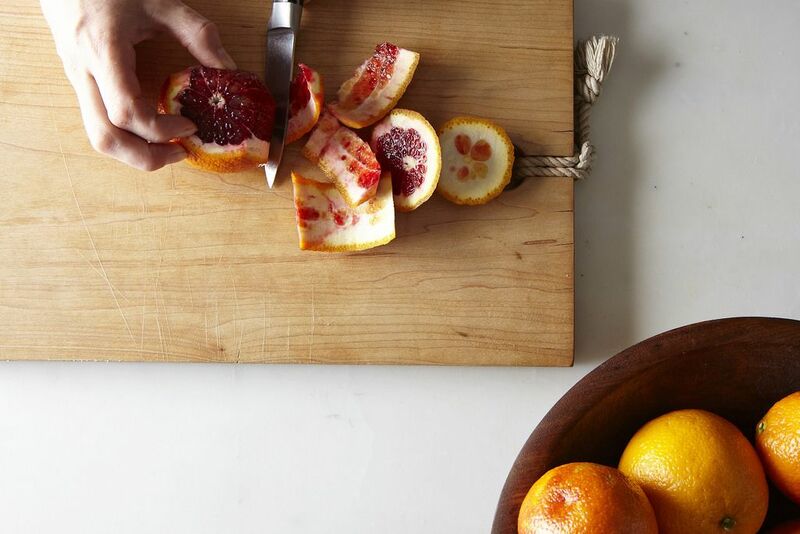 Today: Your comments should be pithy; your citrus should not. 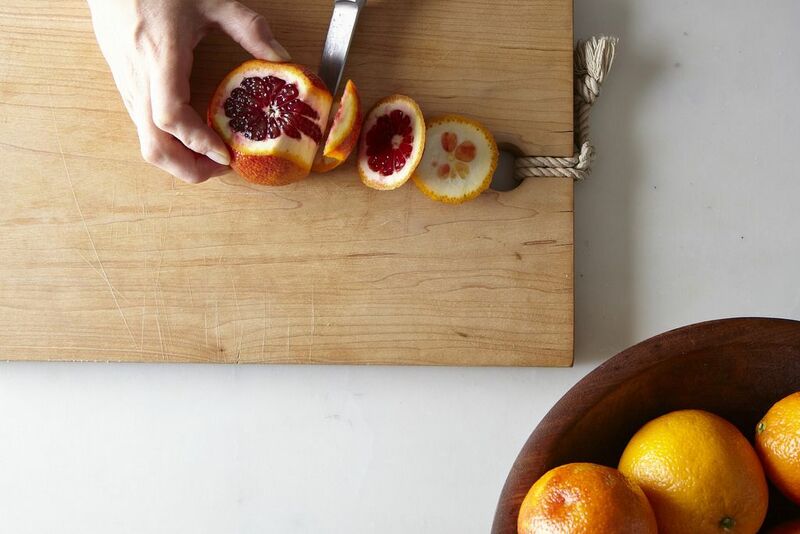 Here's how to achieve perfect citrus segments and leave all of the pith and membrane behind. Are knife skills on your list of New Year’s resolutions? 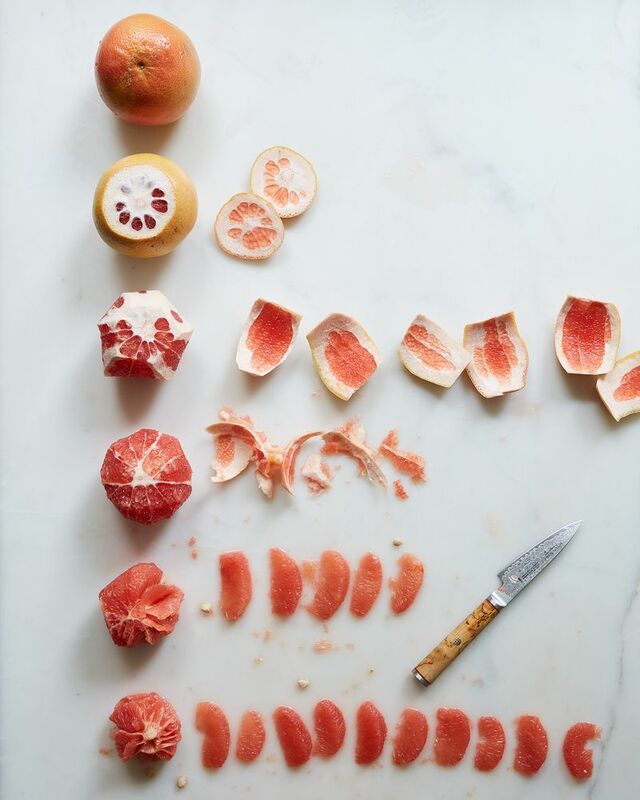 Segmenting citrus is one of the most satisfying (and fun) things you can do with a sharp knife! The results are gorgeous, delicious, and surprisingly impressive to others. Use a straight rather than serrated blade. I like a chef’s knife, but even a 6-inch knife will do, so long as the blade is very sharp. Practice makes perfect. Your fourth orange will be better than your first. Wash the orange rinds. 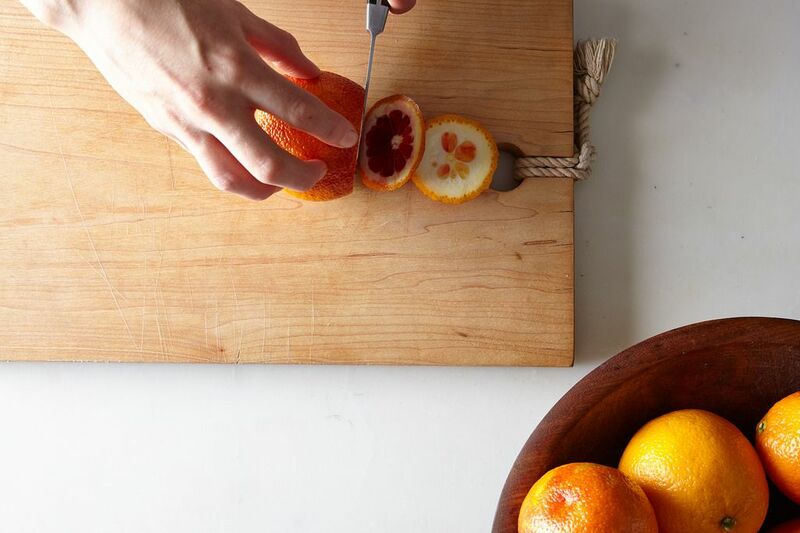 Cut a generous slice from each end of one orange to expose a round of bare fruit about 1 1/2 inches in diameter. 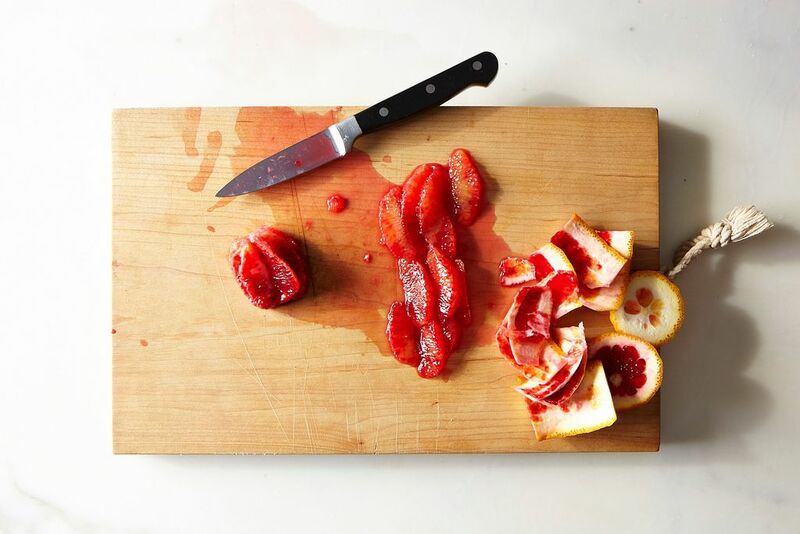 Set the fruit on one cut end on a cutting board. Starting at the top edge of the rind, follow the contour of the fruit as you cut downward with a very short sawing stroke to remove a wide strip of rind, pith, and membrane. Continue around the fruit, removing as much membrane as possible without wasting too much fruit. 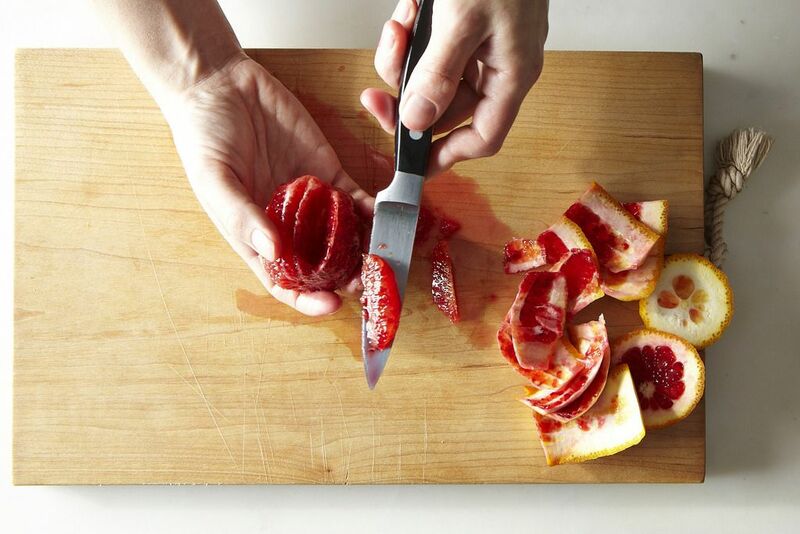 When you are done, inspect the fruit and trim any remaining membrane. 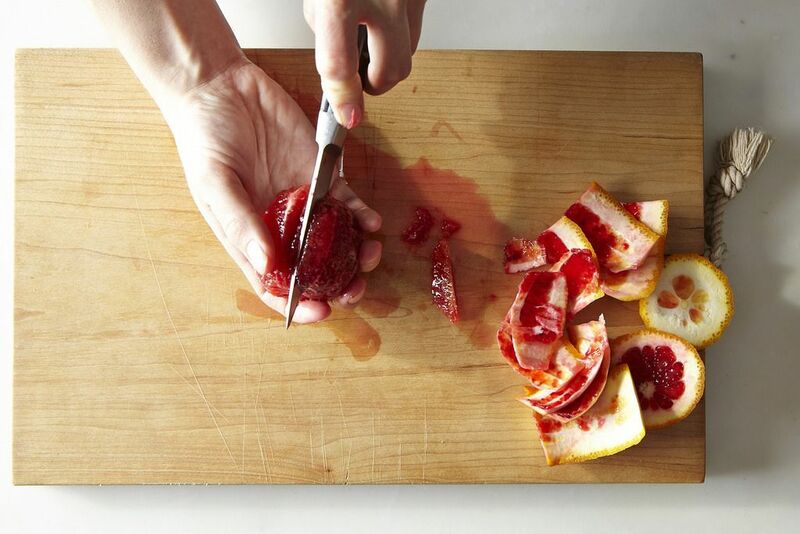 (Tip: If you left a lot of membrane on the end of the fruit closest to the cutting board, remember to follow the curve of the fruit with the knife when you cut the next orange.) Repeat with the remaining oranges. The next step is cutting and removing the segments. You can hold the orange in a cupped hand over a bowl as you work, letting the juices and sections drop into the bowl. Or, if you are not comfortable cutting with the fruit in your hand, place the fruit on the cutting board with one side facing up. To segment, cut into the fruit right next to a membrane. 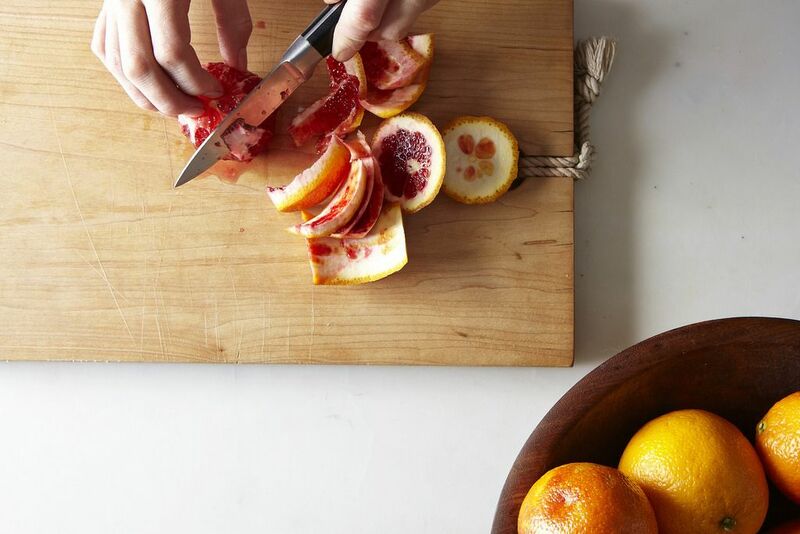 When the blade reaches the center of the orange, rotate it to peel the segment away from the opposite membrane. Or, simply cut both sides of the segment away from the membrane -- whichever method is easier for you. Repeat to remove all of the segments. You'll be left with the membrane attached to the orange like the open leaves of a book. 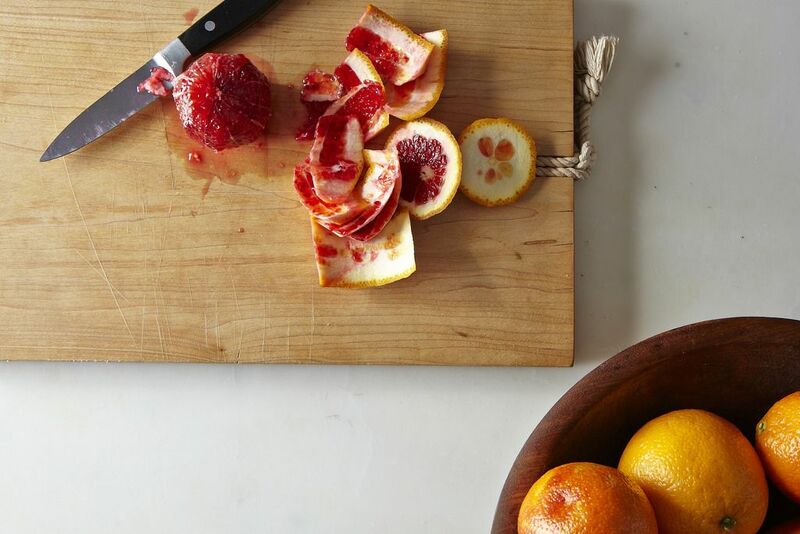 Save any juice on the cutting board and squeeze extra juice from the membranes and the ends of the orange rinds. Secret sharp knife tip: If your knives are not as sharp as they should be, try one you rarely use (my boning knife is always sharp because I don’t use it much!) or use the part of your chefs knife blade that is closest to the handle—it will probably be sharper than the rest of the blade! More: Watch Amanda and Merrill show off their segmenting skills. A pastry chef (formerly of Chez Panisse) taught me to use a bread knife, and I now exclusively use that approach. I find it's quicker, but maybe that's just me? i use a 7-8 santuku to take off the rind, then a small, ceramic paring knife for the segments ... works great! In culinary school, we were told to use a fillet knife for cutting off the peel/membrane. The flexibility of the fillet knife allows it to follow the curves of the fruit. A friend showed me this method on a camping trip years ago. I think of her and that outing every time I make citrus salad (which is pretty often in the winter). Catching the escaping juice is a great benefit as it contributes so much to the vinaigrette. I like to use a flexible cutting surface so I can "drain" the juice into the measuring cup between fruits. A boning knife is an excellent choice for this task. I actually saw some blood oranges on sale this week at our local international market. I'm thinking blood orange panna cotta maybe with some fresh segments on top? Thanks for sharing the guide!